Pedagogical Alliances Between Indigenous and Non-Dualistic Cultures examines Indigenous education for authentic intercultural education. 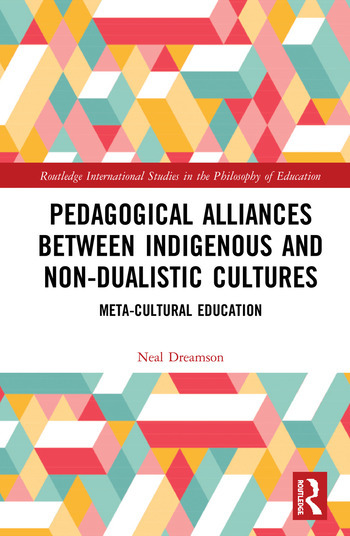 It critically reviews various Indigenous cultural and educational perspectives in Western education contexts, addresses relevant meta-cultural concerns, argues for pedagogical alliances cross non-dualistic cultures/religions, and articulates metaphysical approaches to the alliances. Throughout the book, the author argues that methodological enhancement of Indigenous culture can be made by proposing new values that emerge from authentic intercultural interaction, which is transcendental to the binary oppositions of Indigenous and Western education. To do so, the author discovers pedagogical and methodological vulnerabilities of Indigenous culture in Western education systems, and proposes its pedagogical alliances with non-dualistic cultures (such as Buddhist mindful pedagogy, Confucius virtues pedagogy, and Hindu contemplative pedagogy) to overcome the frame of Indigenous and Western cultures for Indigenous education and to strengthen both Indigenous and non-dualistic education. This is the first book to address the issue of why non-Indigenous cultures other than Western cultures have not been considered in Indigenous and multicultural education. As such it is an invaluable text for education academics and post-graduate students specialising in Indigenous education, cross-cultural education, inclusive pedagogy and intercultural education. Neal Dreamson is Senior Lecturer at the School of Teacher Education and Leadership at Queensland University of Technology, and the author of Reinventing Intercultural Education. He holds doctoral degrees in intercultural education and user experience design. Through his research and teaching activities, he has explored metaphysical and methodological understandings of multi-, inter- and trans-cultural education.